Well… it could be yours to keep! That’s right… I’m giving one away!! Oh I do love giving stuff away on my blog! But first, let me tell you about the camera. 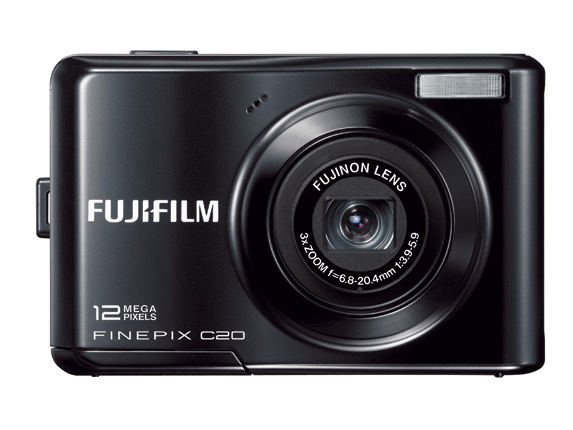 The Fujifilm C20 is a 12MP camera with 3X Optical Zoom. It has face detection, blink detection as well as smile and shoot mode (automatically releases the shutter when the smile appears – how cool is that?!). It can also shoot panoramic images! It also records movies, and allows for easy uploading to Youtube and Facebook! Now, I must tell you that I haven’t used this camera, so I can’t really tell you how it performs, but from the specs it seems to me to be an awesome handbag camera or even an ideal starter camera (maybe as a Christmas gift for one of your kids)! 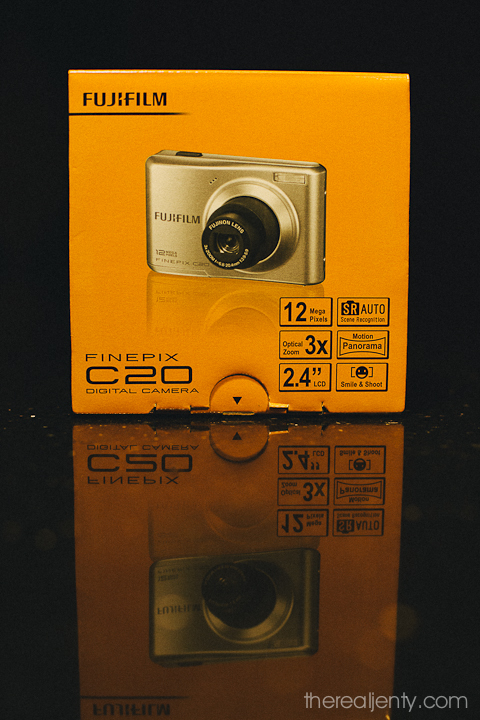 So, you can win this Fujifilm Finepix C20 camera worth R599, by commenting below and telling me what moment you’d wish you’d captured on camera, but missed because you didn’t have your camera on you (or you didn’t own a camera). Get an extra entry by sharing this blog post on Twitter, or on your blog, or by +1-ing, or by sharing or liking the post on Facebook, and letting me know in the comments where you’ve shared it (‘cos I can’t see FB shares 😉 ). Entries close on Tuesday 13 Nov 2012 at noon. Winner will be drawn randomly using Random.org. Don’t forget to like the Fujifilm Facebook page!! Terms and conditions: Only residents of South Africa can enter. Camera will be couriered to the winner. Winner will be notified by email. Have you entered the iPhoneography competition yet? I wish I could have had a camera with me when my eldest was small. I now do not have enough photos of her! G+, Twitter, FB share & FB like > done! I wish I had had my camera with me when I Ran my first 10km race. (shared and liked on FB. Tweeted). This afternoon watching my 2 kids sitting either side of Ouma while she read them a story I missed having a camera that can zoom in a bit without becoming a pixelated blur. I wish I had a digital camera when Ethan was a baby. I only have a small selection of prints that I developed whereas I have hundreds of Zoe. I’m going to share on FB. I often wish I have a camera with me when I go trail running – and this one with the panorama option would be perfect! I wish I had a camera to document every wonderful adventure my boyfriend and I have gone on since we started dating. I’m very sentimental and pictures tell 1000 words when our memories fail us. I wish I’d had a digital camera when my first nephew was born. I missed out on so many precious moments because I didnt have a camera. Have liked & shared on FB & tweeted. The day where I missed a moment because I did not have a camera on hand, was when my child took her second step. The first step no one can catch on a camera because you don’t know when it will be but when she took that second step, I wish I had a camera on hand. Shared on Facebook & Twitter. And liked it. i wish I had a camera of my own to get some one to take pics of me at every function i emceed and did for charity, for weddings and other events! I did so many of them, was all dressed up and dont have one photograph! those were some of the best days of my life! I wish I captured my hubby’s face when I agreed to marry him 11 years ago. I’m going to enter this on behalf of my son who LOVES taking photos but since my little handbag camera was the victim of possession redistribution he hasn’t had the joy as mummy can’t afford to let him capture moments with her camera. I suppose it’s not that we NEED it but more want, mainly because it’s the one way I get to see the world the way he sees it. Ah I missed so many moments when my knucklehead was growing up because I had to rely on 35mm film, and you didn’t just take a picture for fear of wasting a shot and a spool! I wish I had a little camera in my bag when we had the freak snow this year – only had my phone but a camera would have been so much better. Every day and every moment with my 2 girls. I need a camera as I don’t have one. I used to leave my camera behind when I went skiing. I was always sad to do this but my skiing skills weren’t good enough for me to risk taking it along. I missed so many spectacular views. I’d love this camera for J. Shared on FB and Tweeted! Oh man, this weekend was bad because I had nothing and my kids were immeasurably cute in the back of the car, talking, singing, moments I’d normally capture with the iPhone before that person helped themself! I’m very interested in the smile detection!